Remember when the Ocean Cleanup launched out of San Francisco last month to begin its maiden voyage? While that was a monumental achievement in itself at the time, it was really just one more step along the road to actually carrying out what it was built for, which is to actually start cleaning up the ocean. 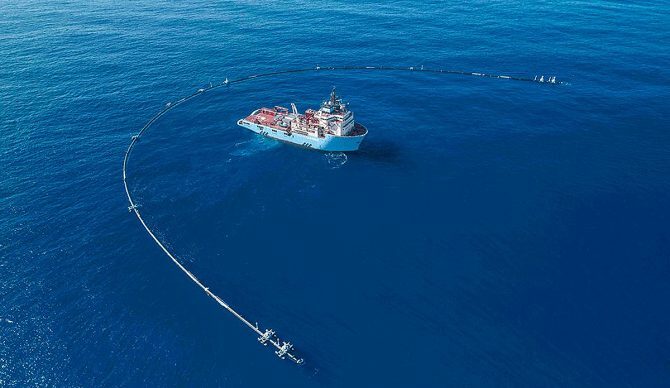 Well, on Wednesday, System 001, the 2,000-foot U-shaped floating barrier reached its destination and was installed in the Great Pacific Garbage Patch. The 1,300-mile journey out of San Francisco was the test run in which the Ocean Cleanup team conducted trials over a two-week period, making sure it could hold its distinct U shape while in transit and even automatically following shifts in wind direction when needed. They felt it performed well enough that it could continue on its path and now they’ll learn other things about System 001 that couldn’t be tested in trials. For example, now they’ll get to see if the system can harness the energy from wind and waves to move faster than the trash it’s meant to collect. And only then will they know how efficiently the entire contraption actually works when put to the task of collecting trash. If System 001 can cover parts of the 1.6 million-square-kilometer Great Pacific Garbage Patch as efficiently as they’ve advertised through development, the team will then release another 60 systems in the next two years. According to their estimates, that would clean half of the plastics currently in the patch in just five years. So keep your fingers crossed. There’s still a lot of work to do.